The mistress is gone. Sure, she was younger – maybe even prettier – but she’s out of our lives forever. From the time he brought her home three years ago, she occupied his thoughts. He even flaunted her. And though the children liked her, she was never very accommodating to them. Conventional wisdom says that most men will have some kind of mid-life crisis. My husband was no exception. I mean, I think that’s what was happening when he got… his car. When his new, turbo-charged Mini Cooper finally arrived at the show room, we watched as the salesman unveiled her. My husband was smitten. 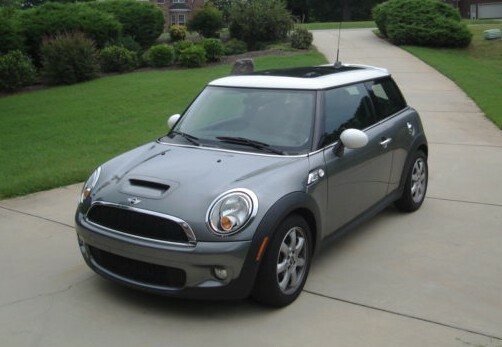 If you have ever seen a Mini Cooper, you know that they are…um…small. Not exactly a family car. There is a back seat, but one of our daughters had to turn her feet outward 90 degrees to sit in it. And they can really zip – to excessive speeds, even with children in them. Every couple has their big blow-out that goes down in infamy. Ours was The Battle of the Cars. It turns out that he felt it was his turn to get whatever he wanted, since previously, I had insisted on a Jeep, which was because he had previously insisted on a big truck, which was because of the vehicle I drove before that, and on it went… (Are you sensing the insanity?) For a span of maybe eight years, we had been keeping score, always comparing to see who had more. Yes. I am embarrassed. So is he. When we finally came to our senses, we tore up the imaginary scorecard. We traded my Jeep in on a vehicle we chose together. And this week, he sold his Mini in favor of another vehicle for us. Now, instead of “my” car and “his” car, we each have two cars we can drive. I will admit to you that I (we) had second thoughts about sharing this story. It would be better, I thought, to have you believe that we’ve got it all together. But I have a hunch that you may also have had your share of blow-outs. Be the one to give more. I promise. You’ll get it back in buckets.